This "Licorne Captive III" unicorn tapestry shows the unicorn in captivity, as a part of the Chasse a la Licorne or Quest of the Unicorn series of tapestries from the 1500s. Here the unicorn is held by a chain to the pomegranate tree which is a symbol of fertility. The background is mille fleur and shows a variety of forest flowers and flora. 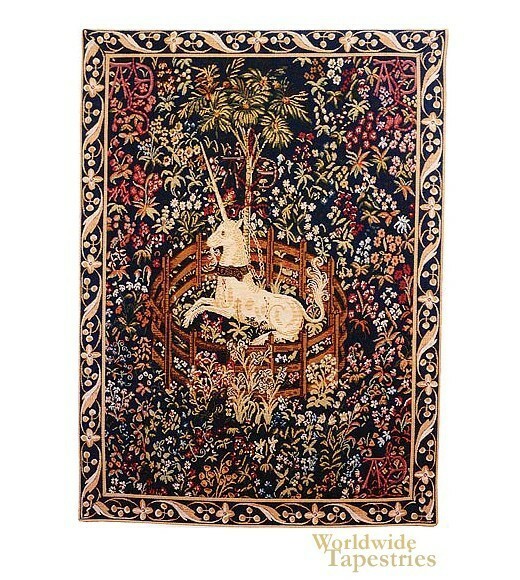 This unicorn tapestry Licorne Captive III is backed with lining and tunnel for easy hanging. Dimensions: W 25" x H 32"